Fast and fabulous handmade Christmas Gift! Did you have lofty plans to make your nearest and dearest a carefully crafted Christmas gift? Did you only just realise that Christmas is in about 2 weeks! Yikes! Never fear… you can still do it…the best thing about this project is actually 2 things. So have a look, find some yarn and appropriate needles - 8ply & 4mm is always easy. And here are the instructions. Basic plain knit bookmarks… look cute with contrasting fringe and embroidery. The main picture is of a Bookmark I made using Moss Stitch (which is simply Knit 1, Purl 1, for the whole row) I then added a Pom Pom for fun! You can see how it’s done below. Click image if you want to go to buy some Pom Pom makers. Add a book if you’re feeling super generous, or just the bookmark is a lovely present. If you need help with any steps, don’t forget my Video Tutorials on You Tube! You can always email me or Facebook Messenger. Anyway, have fun happy knitting and enjoy your Christmas festivities. The independent pursuit of knitting makes it a perfect activity to fit in to our daily lives. However it is often a solitary pass time done in the privacy of our lounge rooms. Platforms such as Ravelry have created 'virtual' knitting groups where knitters share triumphs and troubles. Even so, knitting with others is such a great reward. There is always great Community spirit that comes with sitting down to knit with a group. You can be assure of belly laughs, shared tips and inspiration. Saturday June 13 knitters emerge from their private yarn stash and we bring our wooly projects outside for all the world to see. 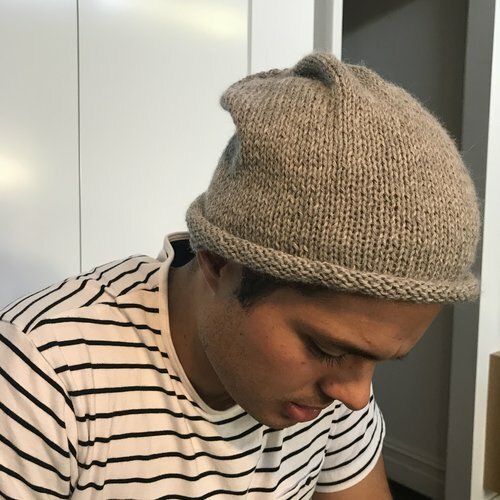 Established in 2005 by Danielle Landes; World Wide Knit in Public Day #wwkipday encourages knitters to meet and show off skills that are often maligned as 'daggy' or old fashioned. It's the day to cast off the shroud of knitting Nanna and knit proudly in public. If you are in Melbourne you are welcome to join What Jane Knits by the banks of the Yarra River at the Arbory Bar from 12 - 2pm. For those who live elsewhere check out the Knit in Public webpage to find a group of like minded knitters near you. So this Saturday pack up your projects and get out there and Knit!